All the magical creatures of myths, legends, and fairy tales come alive at the stroke of midnight in Christmas stories. 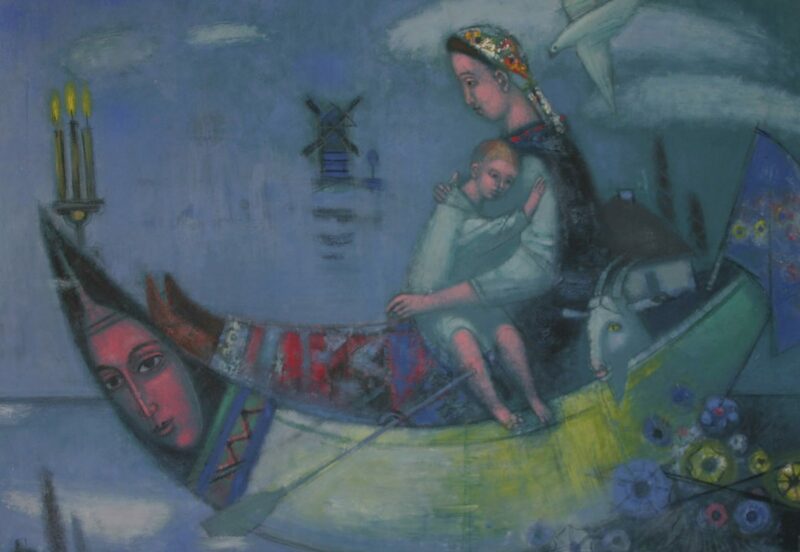 In Victor Gontarov’s Heavenly Boat (Небесний човен) 1998, the child in a dreamlike state, rocking in his mother’s soft embrace, envisions an animated magical universe. 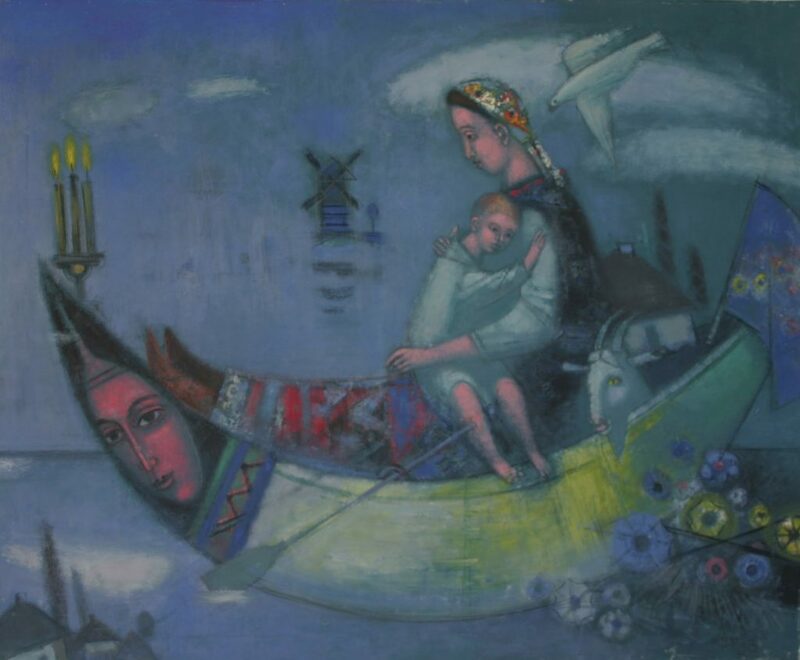 The boat personified by the Siren’s singing face, the dove a messenger of the Divine, the mills, houses and earthly creatures are left behind as the boat gently rocks and floats into a fairy tale dream world. KUMF Gallery is calling for submissions in response to Hontarov’s Heavenly Boat in all media; creative reflections and interpretations, enchanting images of fairies, and creatures that we all would like so much to encounter at the magical time of Christmas. Notification of Acceptance – Artists will be notified of the selection committee’s decision by e-mail or telephone by Thursday, November 29, 2018. Delivery of Artwork – Artwork to be delivered to KUMF Gallery, 145 Evans Avenue, Suite 101 on Saturday, December 1, 2018, between 3 p.m. and 5 p.m. Pick-Up of Artwork – December 22, 2018. TERMS OF ENTRY for the December 2018. All works must be original and created by the artists within the last three years. December 2018 – Artists may enter up to two (2) artworks: painting, sculpture, graphics and photography. Maximum dimensions: 36” inches in width. May 2019 – Artists may enter up to two (2) photography artworks. Maximum dimensions: 36” in width. Artists must submit digital images: jpeg file(s) on a CD or email to: info@kumfgallery.com Subject title: Editions. CDs will not be returned. Digital image file: Jpeg, maximum size 1MB and must include: artists name, title, medium and dimensions in inches and year for each image. Submission fee: A non-refundable entry fee of $30 per work. Please make the cheque or money order payable to: U.C.A.F. Accepted artwork must be ready to display and labeled on the back. Two-dimensional work must be framed and wired for hanging. Insurance: Artwork will be insured by KUMF Gallery for the duration of the exhibition. Insurance to and from KUMF Gallery is the responsibility of the artist.